Not sure if you should take a risk with that Riskrunner? Gravitating towards the Graviton Lance? Or are you simply missing a pair of Lucky Pants? 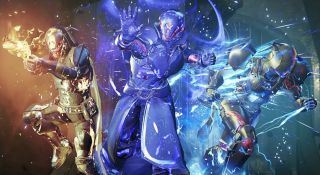 With so many different armour and weapons to choose from, we know it can be overwhelming, Guardian, and we know all too well that what you equip can make all the difference as you take on the alien hordes in Destiny 2. Why should you use it? To be fair, most of us don't want to use it - it's Cayde's beloved cannon, after all. But if you're not as sentimental as us, you'll find reloading after a kill loads magazine with a few extra-damage bullets, while precision kills with this weapon increase reload speed and cause the target to explode, dealing Solar damage to nearby enemies. It also grants a radar while aiming down sights. Enjoy it. Sniff. Why should you use it? Arc Traps sees grenades stick to surfaces and chain Arc bolts to other mines, while Moving Target boosts your movement speed and target acquisition if you're moving and aiming down sights. Why should you use it? Compounding Force is the perfect antidote to enemies with elemental shields, as it causes massive damage to them. Disrupting Break also helps with shielded enemies, as breaking a shield with this weapon makes them briefly more vulnerable to Kinetic damage. Why should you use it? This shoots arc bolts at enemies as well as hack 'n' slash. What's not to love? Black Talon fires off a projectile cross combo, and you'll secure extra sword ammo every other powered sword kill thanks to the Tireless Blade perk. Why should you use it? You can select whatever elemental damage you want with the Borealis, which makes it great for Nightfalls. Breaking an enemy shield will return a bullet to your map, and breaking one of the same shield energy type as you grants bonus damage for the rest of the magazine, too. Why should you use it? What it lacks in looks, the Cerberus+1 makes up for in power. Named after the hellhound itself, it has not three heads but four, and shoots 360 RPM in four directions. Four bullets are fired from the quad-barrelled gun at once, while aiming down sights tightens the bullets spread. Why should you use it? This killer laser does more damage the longer its kept on target. Yes, this is annoying in Crucible. Why should you use it? According to official Vanguard policy, this weapon does not exist. Fast for a hand cannon, Crimson fires in three-round bursts, while kills regen your health, and precision kills refill your magazine. What's not to love? Why should you use it? The Personal Assistant perk gives you a complete rundown of your enemy's health information - you know, just before you obliterate them. It also deals more precision damage with better target acquisition. Why should you use it? Grenades bounce off surfaces to spread the carnage and you can hold to fire and release when you're ready to maximise detonation. Thin the Herd kills will always drop Primary ammo, direct hits are great against enemy shields, and rapid kills against grenade-damaged enemies refill the magazine. It's one of GR+ alumni David Houghton's favourite weapons in The Crucible. Yes, really. Why should you use it? Yes, it was ! @£ing annoying in Crucible for a bit and yes, we were melted by the Lance quite a lot too, but the Black Hole perk rips a hole in space and time, so you get intense damage and no falloff recoil. Cosmology, on the other hand, causes enemy targets to detonate, spawning Void projectiles that also track targets. Why should you use it? Bullets have no damage falloff and ricochet off hard surfaces - which only increases the damage - making them lethal in enclosed spaces. You can vary the elemental damage, too. Why should you use it? The Honed Edge perk means holding down reload consumes the magazine and loads a round with bonus range and damage, whilst Outlaw sees precision kills greatly decrease your reload time. Why should you use it? You can charge up a tracking shot that bursts and explodes on impact, while the energy matched shield explosion disorients nearby combatants. Why should you use it? Le Monarque's perk Snapshot Sights gives you faster time to aim down sights, while Poison Arrows… well, it's pretty clear, I guess, but arrows fired quickly after a full draw become poisonous. Precision shots spread the poison to nearby enemies, too. Why should you use it? A boosted radar helps you see enemies from much further away, while the high-damage Arc energy overpenetrates your foes. Why should you use it? Like all shotties, this returning favourite is devastating at close range thanks to a shrapnel perk, but it's also quick to fire, too. Kills will double the number of projectiles for a limited time. They'll hate you in the Crucible. Why should you use it? While not ideal for crowds, if you can get off five successive shots and land them all perfectly, they'll bind together and become explosive - not fun for the foe you're targeting. The Explosive Shadow perk means slugs burrow into your enemy, and enough of 'em will make them explode. Taken Predator, on the other hand, gives bonus damage against both Gambit invaders and Taken enemies. Why should you use it? Miss a shot with Merciless and it'll charge faster until you finally nail that nail. Reloading after a kill will also boost your damage for a limited time. Why should you use it? Charging this weapon unleashes a giant continuous beam of death - what's not to love - while Unforeseen Repercussions means the beam superheats its targets upon impact, causing delayed explosions. Why should you use it? Precision hits return some of your ammo to the magazine, while landing four precision hits sees you send a deadly delayed Solar explosive round with your next shot. It also becomes more stable the more damage you cause. Why should you use it? Did you get sick of being melted by this in the Crucible? Yeah, us too. The trace beam generates a damaging heat field that gets bigger the longer you hold down the trigger, while kills return a fraction of spent ammo to your magazine, further extending the beam’s duration. It's not much fun being on the other end of it, that's for sure. Why should you use it? This fully automatic sidearm becomes even stronger if your fireteam also has the Rat King equipped. It can stack up to 6 times, making it a bold choice for six-person activities. Reloading immediately after a kill will also make you briefly invisible. Why should you use it? Taking Arc damage while using this weapon and you'll build a brief resistance to it, as well as buffing the power of your weapon. The more kills you get during this "overcharged" state, the longer it'll continue. Superconductor, on the other hand, conducts Arc damage, so shots fired have the chance to become chain lightning and return ammo.